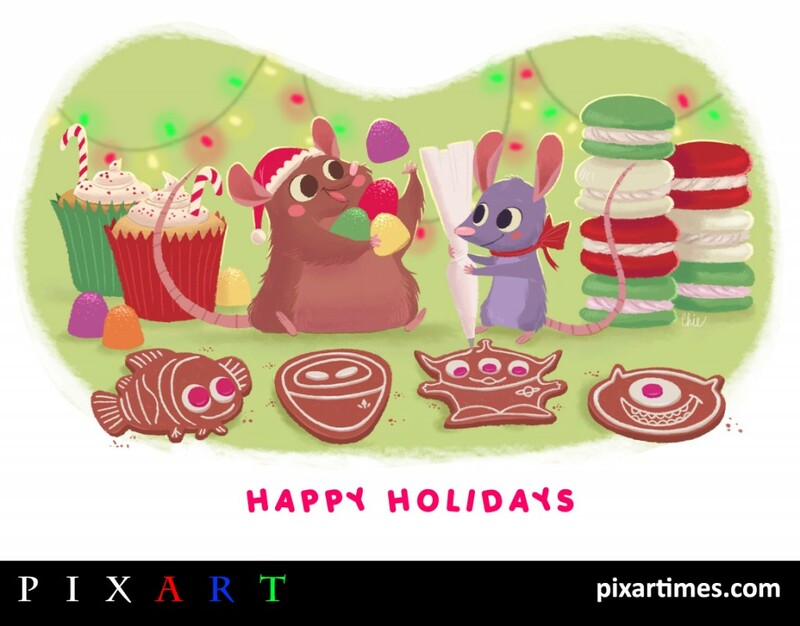 We know a thing or two about cute here at PixArt and that’s why we’re such fans of artists like Chie Boyd! Her adorable creations and cute takes on favorite characters are a joy. Make sure to check out her links to see exactly what I am talking about. We’re so thrilled to have this special Holiday image from Chie and would like to thank her for her time and effort on this sweet piece of art. Read on to learn more about the artist in her own words. The Incredibles! Wall-E and the Toy Story trilogy tie in a close second though. Very hard to choose…but I have a great fondness for Buzz and Woody. What better embodiment of the holiday spirit than family and good food! I figured Remy and Emile would be perfect characters to represent that. Animals, Cartoons, Children’s books, Stationery, Toys– anything cute I see when I’m out and about. Always carry a notebook or device you can write ideas down on a whim. I have “lightbulb” moments at the most random times, and it’s easy to forget them later on without having written them down! Many thanks to Chie for the great piece!